Looking at a photograph by Susanna Majuri is like looking into a river and seeing another world in its waters. Women swim through Nordic landscapes—chasing birds, exploring waterfalls, roaming beaches; each scene a shimmering mirage. Majuri’s photographs blur the line between fact and fiction by constructing an underwater world where reality and fantasy merge together. Majuri has been using water as a medium to construct ethereal photographic images for the past 14 years. 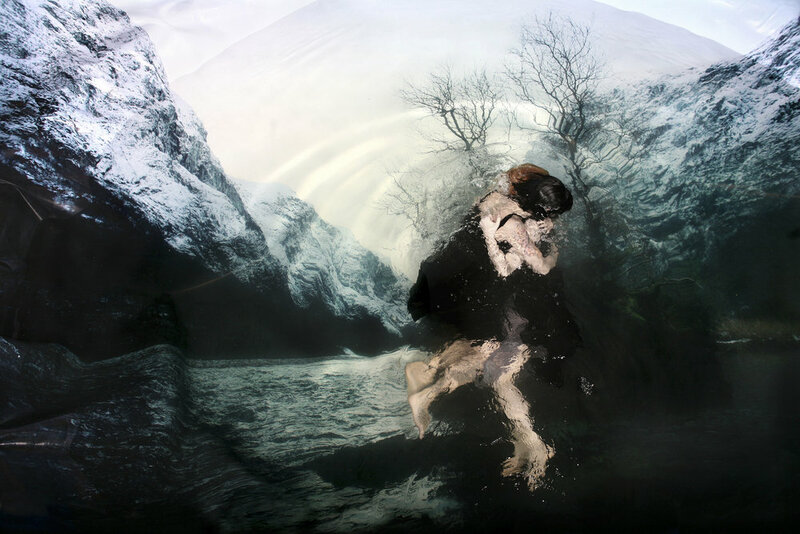 Her studio is a swimming pool where she photographs fully dressed women swimming in dancer-like motions above backdrops of Nordic scenes. Majuri’s use of elaborate backdrops harken back to the early days of photography when painted backgrounds were popular in photography studios. As cameras became more portable, people lost interest in the constructed landscape, preferring to be photographed in real locations. Majuri’s submerged landscapes are printed on fabric and then installed at the bottom of the pool. Making an entirely new setting in her aquatic studio, she transforms ordinary scenes into cinematic dreamscapes. Many of Majuri’s photographs involve women interacting with the animal life in the background images. In one photograph, a larger-than-life raven appears to act as a guide for the two women that follow behind it, one glancing at the other in a moment of uncertainty. The subjects in Majuri’s photographs float through the scenes below them, exploring unfamiliar surroundings as visitors rather than residents in this strange undersea world. They remain anonymous throughout, their faces turned away from the camera or obscured by bubbles or flowing hair. This anonymity keeps Majuri’s characters abstract and her narratives ambiguous. Majuri uses the depth of the water as a layer tool in her photographs. Beginning with a two-dimensional print on the bottom of a pool, Majuri adds visual depth by suspending her subjects in the water. The waves at the surface distort the scene further, and the act of photographing it flattens the image once more. Majuri has stated that she often senses that something strange is about to happen each time one of her models descends into the water, and she embraces the fact that the scenes shift in unexpected and serendipitous ways. It is that feeling of anticipation that she shares with her viewers. Born and raised in Helsinki, Finland, Majuri is currently a photography doctoral student at the Finnish Academy of Fine Arts. She had originally intended to study creative writing, but has found herself telling stories with images instead of words. An imaginative child, her earliest memories involve exploring Finland’s lakes, rivers, and streams with her father. 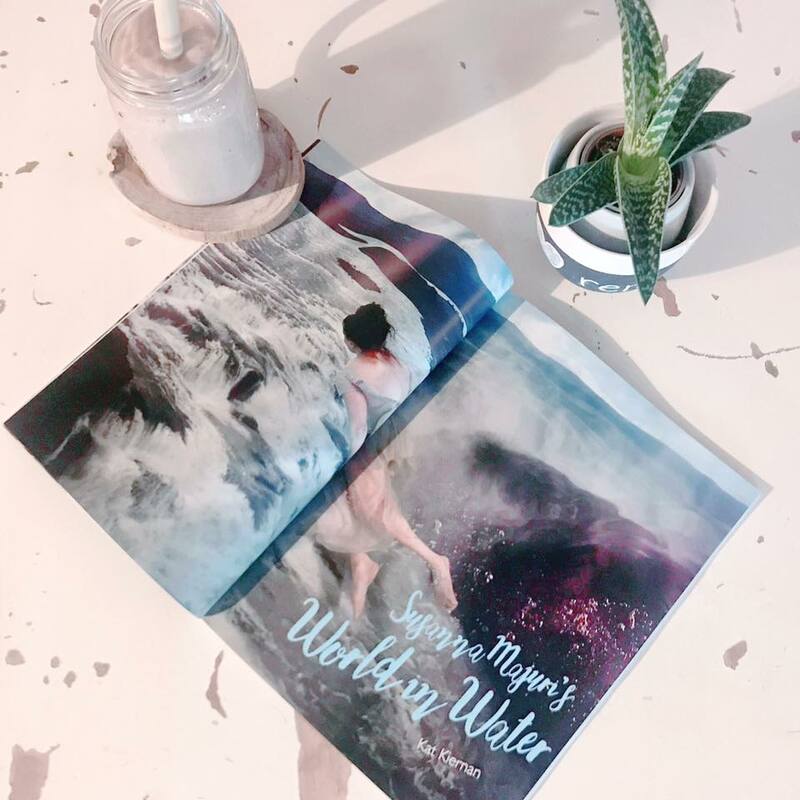 Inspired by her native culture and childhood explorations, the stories Majuri returns to most often are Nordic tales of mermaids, sirens, selkies, and other fantastical creatures. Although otherworldly in their appearance, these photographs are not manipulated in post-production. Majuri relies instead on the transcendental qualities of the water to create her illusions. The women appear to reach out to touch a tree branch or an iceberg only to have it ripple away beneath their fingertips like the dissipation of a dream in the morning light. A wave or a stream of bubbles over part of the background adds to the magic of the photograph. With our feet firmly planted on the edge of the pool, our vantage point never changes, which creates a clear separation between the reality we live in and the stories that she orchestrates. Printing her images at a large scale (40 x 55 inches) allows the viewer to peer into the watery depths. We are reminded of the theatricality of her work in moments where her subjects break the surface of the water. Majuri is not trying to immerse us in her constructed worlds as much as she is inviting us to look down and observe the ephemeral performances taking place below. She makes no attempts to hide the artifice of her set, instead embracing the wrinkles in the backdrops and even offering the occasional glimpse of the pool itself. Looking into the water, we observe the delicate movements of the women below. Each photograph contains a performance that she has preserved as a still frame for us to watch. Peering down into this world of Majuri’s own making, we find ourselves holding our breath too, wondering what it might see if it were looking up at us, our own selves distorted through the water. Kat Kiernan is the Editor-in-Chief of Don’t Take Pictures. This article first appeared in Issue 9.